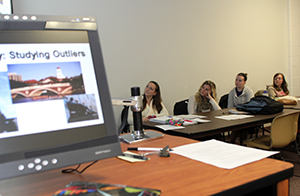 Bloomsburg University's Social Work Program engages in continuous assessment and evaluation practices to ensure quality of the program and to be accountable to the students, accreditation entities, the University, and the community. The primary goal of assessment in our program is to examine the extent to which our educational practices succeed in building the CSWE 9 core competencies that our graduates set out to attain. Additionally, we engage in assessment to ensure that the curriculum and overall program design prepares students to achieve entry level professional competence as generalist social work practitioners. We accomplish this through continuous examination of both our explicit and implicit curricula. The Social Work Program is closely linked to the local and regional community through internships, volunteering and faculty service. It is the practice of the program to involve representatives from the social service community as well as students and faculty in annual Advisory Board meetings to discuss the evolving social environment and to receive qualitative feedback regarding the perceived quality of the social work program and specifically the field education course and internship. The following are current assessment data and outcomes for both of these areas of practice. Some outcomes can be found on links attached and additional outcomes are on file with the program Director and Field Coordinator. Questions regarding assessment information may be directed to Shane Jaynes, Ph.D., BSW program director.